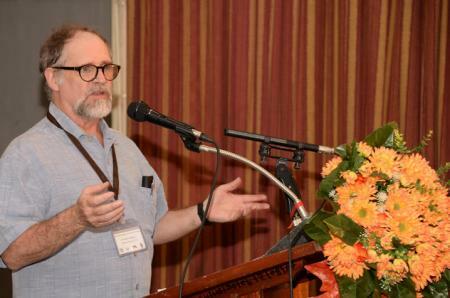 Mark P. Whitaker, a professor in the University of Kentucky Department of Anthropology, was awarded multiple grants to assist in funding an ethnographic workshop on innovative religiosity in postwar Sri Lanka that took place this summer. Whitaker received grants from both the National Science Foundation (NSF) and the Wenner-Gren Foundation in support of his work. 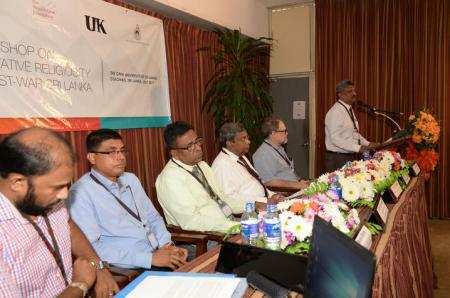 The workshop brought together 17 anthropologists and religious studies scholars at the campus of the Open University of Sri Lanka in Colombo, Sri Lanka. “This gathering of scholars of Sri Lanka’s many politically and sociologically significant religions — Buddhism, Hinduism, Islam and Christianity, as well as many new religious movements — explored the relationship between social upheaval and religious innovation in Sri Lanka and, by extension, in general,” Whitaker said. In an effort to achieve such an understanding, and to cultivate future research on this topic, participants of the workshop plan to publish a summary journal article and a special journal issue or scholarly anthology to bring together the results of their research so far. Sri Lanka is a teardrop shaped island nation roughly 250 miles long from north to south located just south of India. Its population of roughly 20 million people is divided between three major ethnic groups: Sinhalese, Tamils and Muslims. Most Sinhalese people are Buddhist, though less than 1 percent may be Christian; most Tamil people are Hindu, though again less than 1 percent may be Christian. According to Sri Lanka’s 2001 census, Sinhalese people, who control the government, make up 82 percent of the population, while Tamil-speaking Sri Lankans make up only 9.4 percent of the population, down from 18.2 percent in 1991. "Moors" or Muslims make up 7.9 percent of Sri Lanka’s population. Since 1948 when Sri Lanka, formerly Ceylon, achieved independence from Great Britain, Sri Lankan politics have been dominated by a conflict between two competing forms of nationalism, one Sinhalese (emphasizing Buddhism) and one Tamil (advocating a separate state for Tamils). In 1983, civil war broke out between the Sinhalese controlled Sri Lankan central government and various militant, separatist Tamil groups. This war continued until May 2009 when the sole remaining Tamil separatist group, the Liberation Tigers of Tamil Eelam (LTTE), was defeated. The war cost well over 100,000 civilian lives and many Sri Lankan Tamils had to flee abroad. They now live in various countries around the world though the largest enclave of diasporic Tamils, over 200,000, is found in and around Toronto, Canada. Whitaker received his bachelor’s degree in anthropology from Drew University, with honors, in 1978. He then received his master’s degree in 1980 and doctoral degree in 1986 from Princeton University. Whitaker went on to work as an associate professor for a number of years, developing his research and teaching at various universities including Drew University, Skidmore College and the University of South Carolina Aiken. He has been a professor at the University of Kentucky since 2011. Whitaker’s research looks at the connection between religion, politics, communication technology, journalism, nationalism and the state, and focuses on the Tamil speaking people of Eastern Sri Lanka. He has written multiple books and articles about the Tamil speaking people of Sri Lanka, and has delved into questions regarding how cultural practices constitute national dynamics, local social imaginations, and the practical rationalities and moralities of daily life. He has also looked at the often misleading debates about relativism, and has written about the relationship between anthropological ethnography and the philosophy of Ludwig Wittgenstein. The National Science Foundation is a federal agency established in 1950 by Congress to ensure future scientific discoveries and advancement. The foundation’s goal is to support research in all areas and topics that will transform the future of science. Whitaker was awarded their Cultural Anthropology Workshop Grant of $35,345. 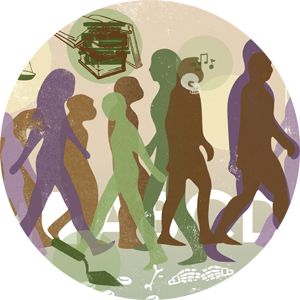 The Wenner-Gren Foundation, founded in 1941, supports anthropology worldwide and offers a variety of grants and scholarships to help further anthropological research and leadership across an international community of scholars. Whitaker received a Wenner-Gren Conference Grant of $19,950.